A 3D modeler is an artist who uses computer software to generate in-game assets as three-dimensional models, bringing characters and objects to life. Many games on the market today use 3D. Overwatch, Witcher III, Playerunknown’s Battle Grounds open beta…Some of your favorite games were produced with the help of hours of 3D rendering. What Do 3D Modelers Do?? 3D modelers render objects in a digital space, and help bring visual assets to life. As a 3D modeler, you could be responsible for any game or film asset. The main character in a game or movie? You might have to render it. A walnut with a significant role in the plot? You might have to render it. A bench, or a bystander? Might fall to you to render them. As a 3D modeler, you’ll work in tandem with riggers, who take your 3D models and make them move and perform the desired functions in-game. Being a 3D modeler isn’t as easy as finding a picture of a walnut and sculpting that with software like Zbrush. As a 3D modeler, you’ll need to stay consistent with the art design throughout the entire process, even if the game goes through significant changes later in development. Modelers work extensively with the art department to nail a consistent artistic vision. This can be both liberating and pressure-inducing. Related Content: Which schools provide the best game design education? Modelers must use the design references already in place by the lead artist and lead designer to fit into the style of game. For example, the art styles in Oblivion are considerably different than those used in Morrowind. Both games are made by Bethesda, and both are installments in the same series: The Elder Scrolls. Yet both games have significantly different motifs and themes. Now, these games were four years apart. Each new console generation yields technological advancements for modelers. The same is true in the animated film world–the technology is constantly evolving, and this is reflected in the capabilities of modelers. With the rise of the 7th generation of consoles, Bethesda had more polygonal (and creative) leeway than with the software capabilities of the original Xbox. You could tell in Oblivion that the rather ‘wooden’ or ‘clunky’ looking 3D character and environmental renders of Morrowind were completely gone. Instead, they were replaced with refreshing, life-like models (at least, that’s what it felt like at the time. We didn’t know what was in store for us with Skyrim). Everything we see in a game has the responsibility of keeping us immersed in the game’s world. And, as a 3D modeler, a substantial chunk of that responsibility falls to you. The substantial graphical improvements had a hand in helping new players find a home in the fantasy world of Elder Scrolls on Xbox 360. A 3D modeler isn’t solely responsible for changing mind and attitudes, but their work contributes mightily to that effort. As a 3D modeler, your work can cause ripples in the shaping of the rest of the game or film industry–like a well-animated pebble dropped into a convincingly rendered pond. Oblivion no longer holds the same “wow factor” that it once did in 2006. This is unavoidable in the ever-changing game and film industries. New software, new practices, and new standards quickly replace the once-impressive modeling of yore. This is an exciting time, not a daunting one. Who knows where modeling practices will be in five years? Or even two years? 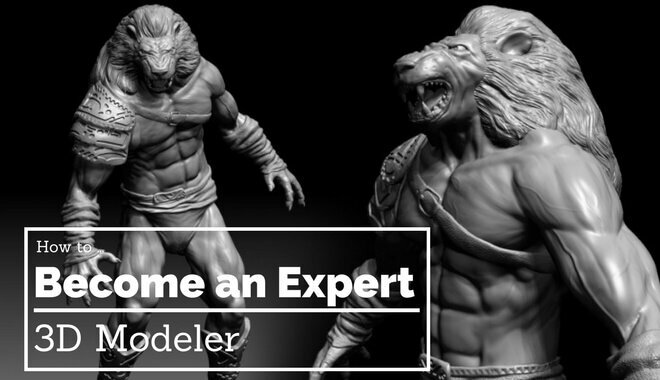 As a 3D modeler, you won’t be confined to the worlds of games and movies. 3D modeling technology has applications outside of entertainment. It’s been extremely beneficial for the medical field in recent years. A 3D model of a problem area for a patient can sometimes be the deciding factor in a difficult surgery decision (and who doesn’t want the guesswork reduced when it comes to surgery?). This pays off big time for patients. They can receive the best possible treatment because the model is specific to their situation. 3D modeling can play a role in medicine before surgery time, too. Models rendered in 3D can give students and professionals a more in-depth look at organs, muscles, bones, and other systems in the body. The benefits of 3D modeling don’t stop at medicine! We’ll probably be dissecting frogs in secondary education science classes for years to come…but that doesn’t mean there’s no room for 3D modeling in science! 3D modeling, combined with the computing power of modern technology, can lead to scientific breakthroughs in less time and with fewer resources. 3D modeling has also benefited those in the field of architectural design. Instead of relying on paper and pencil sketches and outlines, designers can now take their dimensions for a floor plan and translate it into a digitally rendered, ‘real’ environment (we have nothing against paper and pencil–may they continue to serve us well!). Like a video game’s environment, the 3D modeler has to account for space and dimensions, as well as objects or “characters” interacting with the environment. This grants a certain level of accessibility to the building plans. People involved in the decision-making process (excluding the architects) aren’t constrained to just viewing blueprints. These clients or partners can view a 3D model and immediately have a much easier time understanding the dimensions of the project (and some of the nuance, too). You can make quite a lucrative and fulfilling career out of 3D modeling, and certain opportunities will even accommodate working from home. All you need are the right credentials and skills. This artistic field has grown considerably in the past few years. You used to be able to score a decent modeling job on your portfolio alone. It’s now common practice to have a degree in a field like creative design or programming. Is it possible to get a job without a formal education? Yes. But you need to meet the right people and put together an excellent portfolio (or reel). A post-secondary education can afford you the opportunity to do both of those things. Being involved with the art community and having extensive knowledge in creative fields could make you a more interesting candidate for a 3D modeling job. Experience in non-digital 3D art, like ceramics, metalworking, jewelry making, or sculpture, could tip the scales in your favor when applying to jobs. But it could also help you develop a more thorough understanding of how different materials and objects look and interact with the real world. Reddit is always a helpful place to turn when you’re looking for some candid advice. We don’t really care where you’ve gone to school, or what degree you have. We care where you’ve worked and what you’ve done while you worked there. When I’m looking to hire someone, I often don’t even look at a resume, I might only look at their reel. The money we offer them is based on their level of experience and the quality of their work, not their degree. Obviously, this is only one example of a supervisor’s hiring practice, but it’s very telling. Useless? A master’s degree? But it makes sense. Anyone with time and money can get a degree. Not everyone can produce a memorable reel or an impressive portfolio. Make this your “mantra” of sorts when looking for jobs. Your reel and your portfolio are your lifeblood. They are the vessels you can use to show the world who you are as an artist. It seems studios and companies are more interested in what you’ve done, not where you’ve learned. A master’s degree isn’t going to hurt your resume, of course, but the undeniable work you’ve already made speaks so much more to your skills. Anyone can earn a degree. This is a jarring, unexpected concept for students and prospective employees, but this should serve as great motivation, instead. This is your wakeup call–get hands on and work hard on your portfolio. Don’t pigeonhole yourself with your niche specializations either. You should work on multiple, smaller projects to display your extensive range. Working outside your comfort zone shows your employers that you’re willing to learn and you won’t shirk a challenge. The competitive environment and market for 3D artists will no doubt keep you on your toes, but that competition needs to motivate you to create more innovative work and push you to keep improving. In media, a 3D modeler needs to effectively communicate with a project’s other members, like the concept artists, directors, and riggers. As a 3D modeler, you always need to keep the project’s unique artistic vision in mind. To prime yourself for a career in 3D modeling community, you need to learn the industry standards for software. Sure, not every studio will use this software, but the majority of them will (that’s why they’re known as the industry standards). It lets you digitally model, texture, and paint. It’s almost like digitally modeling with clay. This speed render video shows a modeler sculpting a Pacific tree frog with the help of Zbrush. Zbrush is good for sculpting, but you’ll also want to learn Maya. Maya will allow you to do more with a rendered object. Modeling a base mesh, rigging, and animating–these are all possible with Maya. You might not use both Maya and Zbrush all the time. It depends on the project. But prospective employees will be happy to see you’re familiar with both. To be most effective as a modeler, you’ll need to use references. References are images and videos you pull from as you model. It helps with proportions and coloration, but it can also show you how things move, or how different material interacts with the world (i.e. how hair falls when it’s straight vs curly or dry vs wet). Knowing anatomy can be helpful, but using references is a good way to supplement your understanding. Intimate knowledge isn’t vital–keen observation skills can be just as valuable. 3D modeling also requires you to have a good feel and concept of weight, volume, and form. All of these elements lend a hand in creating realistic models. Working knowledge of the right software only gets you so far in the business: for the best chance of entering the field, you’ll need to eat, sleep, and breathe 3D modeling. If you want to do it for a living, It can’t be a side hobby that you dabble in every now and then. If you want to get serious about it and make it a career, you need to be 3D modeling every day. As tired as you are of hearing this advice, it bears repeating. The only way to get better as a 3D modeler is to constantly be 3D modeling. Practice, practice, practice. You should be creating—in some form or another—everyday. You won’t get a job just by showing up. You’ll need to set yourself apart so you can shine above the thousands of (other) students eager to get 3D modeling work.